The project TRAPP will develope a vocational and educational training (VET) programme in the field of phlebology, a specific discipline of the medical profession. Until today, implementation of the EU VET tools and recommendation has not been carried out in the field of phlebology and therefore no harmonized training standards, qualifications and VET accreditation are available. This depends on the fact that this discipline, which deals mostly with the treatments of venous and lymphatic disorders, although fully recognized does not have specific specialization courses in most of the Member States; on the contrary, education and training in topics connected to phlebology are often included in courses having a wider scope. The practicing phlebologists are currently doctors specialized in dermatology, venereology, etc. ; furthermore, the required qualifications are different in each Member States and no common definition or classification of the profession at EU level exists until now. 2. Open and innovative practices in the digital era. The European VET system needs to be modernized and the uptake of IT tools can make the learning experience more attractive for trainers and learners. This modernization can also contribute to enlarging the market of IT learning tools and the production of the companies of the sector. Aware of this primary need, the project will develop and launch two new IT platforms, the e-learning platform (cfr. O2) and the online hub for career and training guidance (cfr. O4) in an optic of lifelong learning. Both platforms will become permanently available to the VET community and could be further developed in the future. In addition to that, we have the privilege to enrich the digital tools at the service of education with an innovative digital simultaneous translation software. 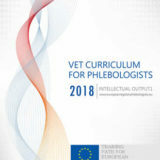 Further strengthening key competences in VET curricula: the first EU-wide VET curriculum entirely dedicated to phlebology will contain all the most relevant and important key competences that are currently required to exercise the profession and that are commonly recognised as such by all the national societies of phlebology and by other specialised training institutes. Build a platform at EU level for the guidance of practitioners on continuing career-oriented VET paths. The definition and regulation of the occupation and training in phlebology will contribute to the implementation of the Directive/2005/36/EC, and as amended by the Directive 2013/55/EC, by making it easier for entitled professionals in the area of phlebology to practice elsewhere in the EU and therefore to fully enjoy the free circulation. This effect will also contribute to the implementation of the Directive on the Posting of workers (Directive/96/71/EC) whose review and implementation is among the policy priorities of the Junker Presidency.